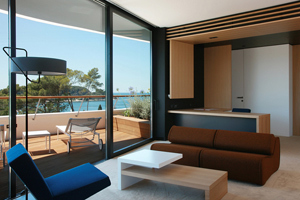 Hotel Lone, the first design hotel in Croatia, is situated in the Monte Mulini forest park, Rovinj's most attractive tourist zone, located in the immediate vicinity of the legendary Eden Hotel and the new Monte Mulini hotel. The surrounding grounds and parkland is a unique and protected region of the Monte Mulini forest on the Lone Bay. The term design hotel is meant to illustrate this as a space that nurtures the concept of an interesting and functional design. Created by a team of renowned Croatian creatives comprised of a new generation of architects, conceptual artists, product, fashion and graphic designers. The Architects from studio 3LHD were responsible for the design and construction of the hotel building. In addition to the overall architecture, the interiors and the furniture were designed and chosen especially for the hotel in order to achieve a distinct and recognizable identity. The designers from Numen/For Use designed the furniture. The fashion studio I-GLE designed the staff uniforms and other textiles. 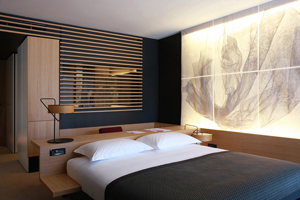 Artist Silvio Vujičić created graphics on fabrics for the rooms. Installations in the hotel lobby were made by a group of innovative artists: Ivana Franke - "Room for running ghosts"; Silvio Vujičić - "In the hanging garden no one speaks" and the fashion studio I-GLE - textile compositions No1, No2, No3. Studio92 designed the Wellness & Spa center, while Studio Kappo did Landscape design. The agency Bruketa & Žinić OM conceived and oversaw the visual identity of the hotel. The hotel's identity is recognized through the external design of the building, with a facade that is defined by dominant horizontal lines – terrace guards designed to evoke the image of slanted boat decks. The building's floorplates contract from level to level going up, creating an elevation that is tapered at all angles. The site's complex terrain with dramatic altitude changes determined the locations of internal facility spaces through a dynamic interweaving of public areas and guest suites at all levels. The specific Y shaped ground plan enabled a: rational & functional organizational scheme; quality views from all rooms; and the grouping of public facilities around a central vertical lobby. The main lobby connects common spaces on all levels, creating a central volume of impressive height and scale with interesting views in and around where all vital functions of the hotel take place. When designing the interior, 3LHD and the designers from Numen/For Use chose the surrounding ambiance as the hotel's signature visual element which also defined all views of the interior. With that in mind, the walls in the rooms are covered with mirrored panels, distributed in a random pattern which reflects ambient light and Mediterranean greenery, pulling them deeply into the interior, filling it with the exterior. The greenery also reflects on the glossy surfaces of ceilings in public areas, intensifying the effect of the surrounding plants. The visualy light and open space of the lobby is covered in white stone surfaces and beige-golden fabrics, the oval lines of the mezzanine guards and the furniture enhance the fluid character of the space and are in contrast with the intimate, subdued tones of the rooms and suites where the atmosphere is calmer, materials warmer (wood and carpets), the colors darker and lighting dimmer. The entire design of the hotel is based on contrasts (black, white, wood) and fabrics as the unifying element, varying from a fluid thin veil in the restaurant, through functional but dynamic wall coverings in the rooms, to the richly decorative mural in the lobby. The conceptual assumptions used in the design of the hotel and its interior show evidence of a deep respect towards the achievements of hotel architecture on the Adriatic Coast from the previous century, combining it with a strong modernity expressed primarily in materials, functions and typologies and consequently in architectural forms. The hotel has 236 rooms and 12 suites. 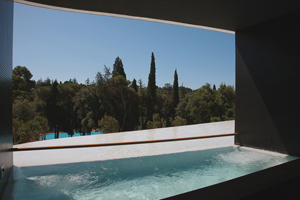 16 rooms offer an exclusive experience of a private massage pool built in the room's terrace. All the rooms are suitable for all types of guests. Rooms with king-size beds, twin beds or connected rooms are suitable for families. The hotel has three restaurants "L", "ON" and "E", two bars, a jazz club and a mini club. One of the main characteristics of the hotel is the state of the art high-quality conference center with 4 conference halls, several meeting rooms, and a VIP lounge fully equipped with the most advanced technology and an accompanying bar. The common denominator, exquisitely designed furniture, connects all the hotel's areas. Most of the furniture are carefully selected manufactured pieces, but also includes items made especially for this hotel by the well known design group Numen/For Use. To achieve immediate recognizability of the interior, the Numen/For Use group chose probably their most famous furniture piece, the Satyr armchair (Wallpaper award for Best World Sofa 2007), as an object with character and strong identity. The Satyr is present in all rooms with different colors of textile depending on the room's position. Another signature piece found in all rooms is the lamp made by Dekor from Zabok and designed especially for the Hotel Lone. The lamps also differ in materials used for lampshades depending on the position in the room. During the day they "drown" in their background and dematerialize their volume, while at night, when turned on, they enhance the comfortable and warm atmosphere of the room. Most of the furniture in the public spaces is also designed by Numen/For Use, the series of seating elements Transform, Y chair and C chair produced by the famous Italian furniture company Moroso. Some of the furniture is made from massive oak, tables XYZ and models X-L and X-Z are from the Element program made by Intera, Zagreb. Intera also made the specialized foldable armchairs for terraces and chaises with integrated parasols. These products were made especially for the Hotel Lone and in the future will be available to the public. In this way the development of this hotel becomes more than just another tourist project - it represents a driving force for the development of domestic production of designer furniture, which should serve as a role-model to all investors in Croatian tourism. To avoid the classic ideal of Gesamtkunstwerk, the furniture in Hotel Lone is not bound to only one designer name or collection but rather consists of a variation of designer pieces. For example, the Tio collection by the design duo Chris Martin and Magnus Elebäck from Massproduction; Tropicalia chair by Patricia Urquiola for Moroso, the 1966 collection by Richard Schultz for B&B Italia; and an especially interesting piece we would like to single out is the conference chair GF 40/4 by David Rowland for Howe, which was designed more than 40 years ago and still represents a timeless model for a conference chair. Materials: Aluminum tubes, PFA monofilament (fishing line), steel wire. In her work, internationally renowned visual artist Ivana Franke explores the relationship between phenomena and materiality by questioning the experience of spatial dimensions and human perception. Her large installation made as a tensegrity structure - structure in which stability is attained by tension and compression of elements, while at the same time solid objects do not touch each other, is featured in the lobby's central area. Within the monumental spatial volume of the lobby, the installation draws a visually transparent system of dense spatial intervals, which enables reading the space's dimensions through the space itself. All the rooms and suites are decorated with unique graphics by the well-known Croatian artist Silvio Vujičić. The graphics are based on an exploration of Istrian cultural heritage and frescoes from the 15th century. The details from frescoes, more precisely samples of patterns from the dresses of martyrs, were often used as motifs by painters, graphic artists and weavers during that century. The patterns were copied, used in other media and transferred from graphic to textile art and then to frescos and vice versa. In his graphics, Silvio Vujičić uses these textile patterns from frescoes again and returns them to their original medium: graphics and textile. Produced as serigraphy on white cotton canvases, the graphics contain the signatures of old masters and draw attention by the unique technique of their production while simultaneously engaging with the motives of creased curtains. The samples of draperies from frescoes were reconstructed from the St. Catherine's Church in Lindar (1409), St. Mary's Church in Dvigrad (cca. 1470-1484) and St. Mary's Church in Škrilinah in Beram (1474). Silvio Vujičić's installation "In the hanging garden no one speaks" adorn the wall of the lobby next to the entrance and rises up two floors. A type of bio-machine is made from supports of different lengths and sizes that carry the rhythmic arrangement of wooden baskets with live plants and create a form that resembles a curtain. Irrigation and fogging systems enable the sustainability of the installation. The designers from the studio I-GLE made their artistic contribution to the hotel in the form of three installations that will adorn the front desk and the lobby. The compositions are made from textiles in dark colors, of different textures and rich weaving that simulate the dynamics of natural phenomenon characteristic for the seaside ambiance through rhythmic folds and diffraction of light on the surface of the textile. Hotel Lone is a virtual shop window of the South-Eastern European creative industry. Its visual identity was designed by the agency Bruketa & Žinić OM, with several awards one of the most lauded agencies in this part of the world. The visual key is inspired by the central lobby, the most impressive volume of the hotel, which rises up throughout the entire building's height. This is the area where hotel's wings are juxtaposed with the adjacencies of most important facilities, this serves as the origin of all activities. It is the hotel's "heart". Therefore, that shape was chosen as the symbol that changes depending on which part of the hotel it is used for, or in other words, from which perspective it is observed. The "heart" is the driving force of all activities in this inspiring place that will serve as a venue for relaxation as well as business meetings. Therefore, it was derived from illustrations which combine the disparate and makes up the basis for a huge poster 2 x 4.2 meters in size. All the applications of visual identity are derived from this big poster divided into twelve parts. Therefore, each application is part of the unique common picture, such as the hotel itself, made up from different parts of domestic creative industry, becoming its own shop-window. Projektni biro - grijanje d.o.o.